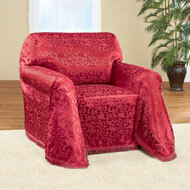 Geo Stretch Furniture Cover Protector from Collections Etc. $19.99 - $29.99 $16.99 - $26.99 Save up to 15% Now! 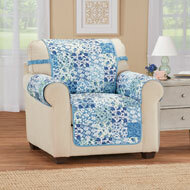 Give your furniture an easy update with these attractive slipcovers that stretch for a perfect fit. The machine washable covers fit recliners, chairs, loveseats and sofas and help protect your furniture from spills and pet hair. Sofa fits most sofas up to 90"W arm to arm. Loveseat fits most loveseats up to 73"W arm to arm. Chair fits most chairs up to 40"W arm to arm. 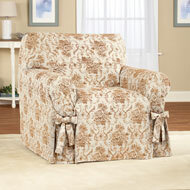 Recliner fits its most recliners up to 40"W arm to arm. Machine washable. Polyester and spandex; imported. Color available in Grey, Burgundy or Taupe. 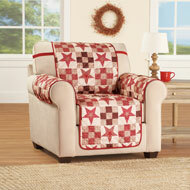 Size available in Chair (96" x 38"), Recliner (118" x 38"), Loveseat (96" x 62") or Sofa (96" x 77").